Detective Comics is literally the flagship title of the DC Universe. In fact, it is where the D and C come from in the name. So, there is a great deal of expectation when it comes to this title. Toney Daniel and Ryan Winn have a lot of pressure on them. While this is a decent book, it is nothing overly special. If you were already into Batman, there is nothing to make you change. If you were not already into Batman, there is nothing really to make you stick around other than, of course, it's Batman!!! The artwork is quite well done. The lines are crisp. One thing I have noticed, along with artist luminaries like Gary Kwaipicz, is that while teh artwork has hit kind of its max, the coloring is where the innovation and new magic is. The color palettes and textures used in these issues is phenomenal. The use of shadow to bring across the macabre of Arkham and the sinister Dollmaker was quite excellent. 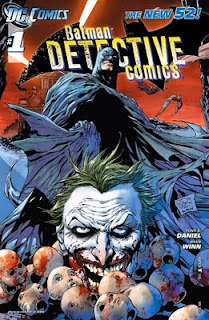 Overall, I felt this should have been the Batman title and the Batman comic story should have been Detective, because there was more internal reasoning and such going on with the Batman story than this one. There is more of a sense of mystery in the Batman storyline than in this story. I do have a sense of foreboding, that we may see some serious shakeup in the supporting players, as issue three promises a decision on the fate of Jim Gordon, who appears to fall victim to this new villain the Dollmaker. However, the story is jagged at best. It is the art and the colors and visuals that save these two books. However, there is enough interest to keep me at least checking on the book to see what is going on, if not making it a regular buy.